On November 4th, I hosted a clay class for kids at the Dedham Community House. The class was an hour long workshop designed to give kids, 1st through 5th grade, exposure to clay. They learn techniques and create a piece of pottery. There is always a literary or art component to my classes so kids can take away an art history lesson as well as a hands on experience. Having a theme is always fun and “Thanksgiving” is a great one! There is food, foliage, and many stories the kids want to share about their own Thanksgiving traditions. The kids start with a slab of clay to practice with. We talk about rolling coils for a frame. 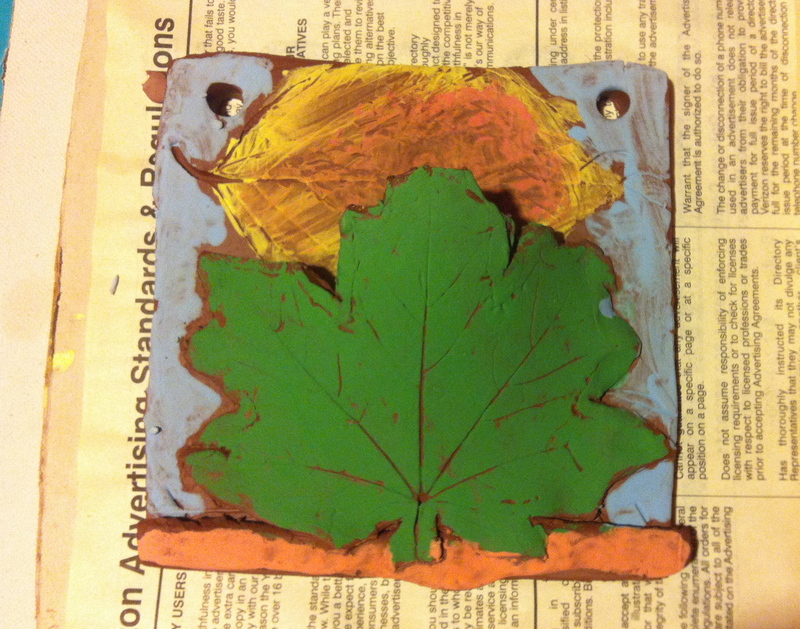 We talk about making impressions with objects such as leaves and stamps. We talk about attaching clay images to the tile by using the slip and score technique. We talk about carving into the clay. Once they have had time to play and try out the different techniques, I give them a fresh clay tile. We stop for a minute to talk about Thanksgiving. I teach them about Norman Rockwell and show them pictures of his famous holiday meal painting. We talk about the students’ holiday traditions and then they begin their project. Some of the students decide to make wall pockets with their tile, so we add holes. We let the clay dry a little and then the kids add color with paint. After class, I take the tiles home to my studio where they have ample time to dry. I paint them with a clear glaze fire them in a kiln at Potters Place. Once finished, I added a couple of items for the students … an easel for display or a pretty ribbon for hanging before packaging them up for the students. I will be offering my next Clay Class for Kids on Monday, December 2nd. The theme will be “Animals”. The class takes place at the Dedham Community House from 3:15-4:15pm. The deadline to sign up is Friday, November 29th. Click here to register. is a great way to try it out. Each student will create a hand built item from about a pound of clay. Different dates will have different themes and teach new techniques.